Capraia is the north-westernmost of the seven islands of the Tuscan Archipelago, the third largest after Elba and Giglio, with a population of roughly only 400 people. Capraia is about 40 miles from the city of Livorno by sea and can be reached by ferry on a daily basis. Ferries dock at Porto di Capraia, the island’s only port, connected to the village by the only asphalted road you’ll find on the island. The rest of the island is connected not by road, but by pathways and taxi boat services. You can also join a tour group of six to twelve people, which is a great way to see the island’s scenic coastline and hidden beaches. These tours start in the morning, at noon, in the early afternoon and at the end of the day, normally lasting from two to four hours. As well as being famous for its wine, anchovies and natural beauty there are also quite a few other attractions worth taking a look at while you’re there. One of the island’s most popular walks takes you through the ruined buildings and agricultural complexes that were part of the Capraia’s penal colony in times gone by. Other walks will take you past the ancient ruined church of Santo Stefano, not far from the La Piana vineyards. 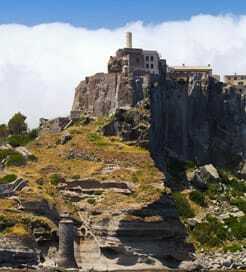 Capraia Island’s village is overseen by the Fortress of St. George, although sadly this is under private ownership and is not open to tourists. Up to time. Comfortable. Good catering for travellers early in day. "At sea on Giuseppe Rum"
This summer for our holiday to the Isola del Giglio we travelled with Toremar onboard the Giuseppe Rum ferry. We were only passengers with no car, I found really helpful that I could leave the luggages inside the garage in a reaservet place. We are really keen to this ship because every eving arrive to the Giglio port and the nex morning at 6.00 sets sail again, so it always been a permanent precesence during our dinners and evening walks along the harbor. More than once we took picture with it. Cleaning, services, staff helpful, I am a bit sad because the crossing was too short. "Ferry crossings - excellent service"
We travelled from Piombino to Portoferrario and return, taking our car. The service was extremely efficient both ways. Good cafe on board. On return journey we arrived early and since there was space on the earlier ferry we were able to travel sooner with no problem. Would certainly recommend the service. 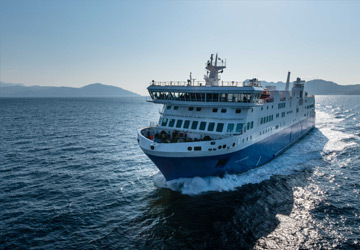 For more information, please visit our Ferries from Italy to Capraia Island page.